ColorCube Inc., is a custom graphic design and screen printing business located on Colden Street in Newburgh, NY. Although the company started small, it has since experienced tremendous growth in recent years. 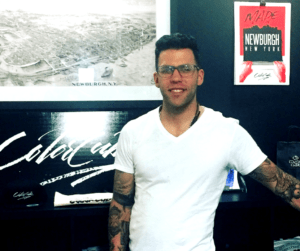 Known for its customized and artistic Newburgh-centric T-shirts, as well as high-end graphics and logo designs, ColorCube is a go-to business for other businesses in Newburgh. Founder Vinny Colandrea is a longtime Newburgh resident. It was his education in Newburgh’s public schools that first gave him a love for graphic design. “I studied viscom (visual communications) and architecture and motion graphics and stuff. And a couple of teachers put me onto Photoshop and Illustrator before I went to college.” said Colandrea. He credits his education at Newburgh Free Academy for the advantage he felt he had over other graphic design peers at Rochester Institute of Technology (RIT), where he attended school. Upon graduating RIT, the first job Colandrea landed was designing graphic tees for a printing company in Middletown, N.Y. Eventually, the printing company promoted Colandrea to a managing position. That experience gave him enough know-how to handle multiple aspects of the business, beyond the graphic design skills. Shortly after getting married, Colandrea decided to create his own business, initially setting up printmaking equipment in his garage. By 2005, ColorCube Inc. was born. ColorCube’s skilled art department takes high-quality photos, creates in-house graphic designs, or works with clients to develop a custom logo specific to an event or business. ColorCube prints the design and takes it into their dark room to burn the inverse of the image onto the screens. Employees prep dried screens and put them on the press. The number of screens usually equals the number of colors used. However, darker T-shirts may need an additional screen to lay down a primer coat. The shirt moves around the automated press, first receiving a base coat and then any additional color coats, drying in between colors. Once complete, the shirt goes through the dryer, reaching a temperature of over 375 degrees Fahrenheit in order to completely dry the ink. The shirt is now ready to be boxed and shipped to its final destination. Opening a business isn’t easy, and Colandrea soon realized he had to specialize his brand in order to compete with other T-shirt makers in the area. “While I was a good graphic designer and while I focused hard on hustling and always putting out good work, my angle was that I didn’t want to be a mom-and-pop shop. There are a lot of screen printers out there that don’t have good design principles. They just know how to print and they make T-shirts,” explained Colandrea. While Colandrea wasn’t fond of the bookkeeping end of the job, he loved creating brands, especially about the city he calls home. The company quickly outgrew Colandrea’s garage, and currently occupies a building on Colden Street with an expansive view of the Hudson River. Colandrea attributes this location to inspiring logos and T-shirts that promote the city and its inhabitants. “We draw inspiration from the Hudson River, which we can see from our door, as well as the strong community of artists we are proud to be a part of. Working alongside our fellow professionals and visionaries helps us strive to be ever evolving in our craft and making the most of each day. The Cube is proud to bring our art to life here and call the NBNY home,” the ColorCube website states. Colandrea hopes to continue to grow the business, which has already proved successful over its decade-long operation. He envisions 15 employees – the company has five at the moment – and an additional automatic press. Most importantly, he wants to be able to offer jobs that provide livable wages to workers by continuing to increase production. 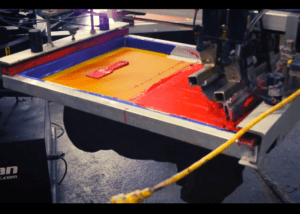 His automated print-making equipment currently uses screen printing where each color is printed through a separate screen. However, there is now cutting-edge technology available called DGP (direct to garment printers) that acts as an inkjet printer for T-shirts, which would streamline the process even more. It’s one possible investment Colandrea has been considering as he looks to grow the company. “We have a couple different directions we can go here, and we’re starting to brainstorm on what the best one [is]… this is something that I need to consider as far as the capability of the shop,” Colandrea added. Each year Colandrea sees the business growing, both in numbers and influence. “Our sales go up 20% each year and we pick up another full-time employee each year. There’s a better awareness of our brand and what we stand for in our quality. We are not your typical screen printing shop,” Colandrea clarified. 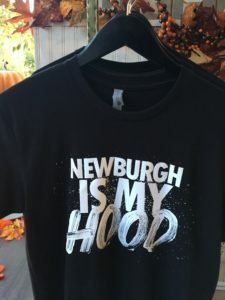 ColorCube Inc. is an active participant in Newburgh community events, designing logos and T-shirts for Newburgh Illuminated, Newburgh Open Studios, and even developing a map of Newburgh’s growing downtown, updated every January. Some of their community work has even been done pro bono, such as developing signs Newburgh Last Saturday events. Fortunately, as the company continues to grow it’s able to give back even more to the community. In the past year they added new equipment and more onsite event screen printing. For example, ColorCube Inc. recently featured a portable printing press and dryer at a veterans football game. 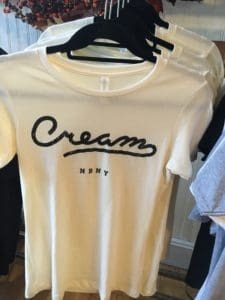 They also offered sidewalk T-shirt printing for the 2018 End of Summer Bash held at Cream Boutique 101 Liberty Street in Newburgh’s East End Historic District. 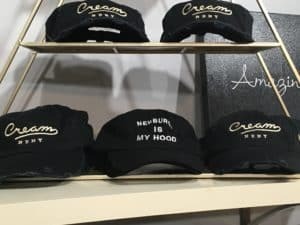 Amal Ishak, owner of Cream Boutique, features several ColorCube designed T-shirts and hats in her store. A Newburgh business owner herself, Ishak wouldn’t work with anyone else besides the ColorCube team. Ishak, like many Newburgh owners, believes in the importance of working with and featuring products from local businesses. “I would rather pay five dollars more and keep it local,” Ishak said. She added that she trusted ColorCube to produce quality products. When he’s not printing swag for community events, Colandrea heads up ElementSix, a self-described “entrepreneurial network, incubator and spiritual council.” This group brings together a diversity of local business owners to collaborate on community projects together. Their goals include fostering learning between new business owners and other more-established businesses in the area. Newburgh businesses and organizations involved in ElementSix include Hollenbeck Pest Control, Blacc Vanilla Cafe, Play For Your Freedom, and many others. The group has been officially operating over the past year. 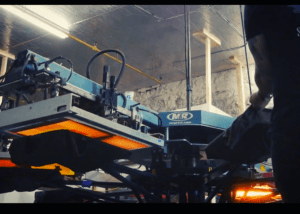 While this local screen printing shop started small, the company now handles orders anywhere from 12 to 25,000 pieces. – promotional products, and more! Typical clients include clubs, schools, sports teams, and businesses, all of which can order custom apparel. ColorCube Inc. designed shirts can also be found in shops around Newburgh, such as Cream Boutique, the Liberty Street Bistro, the Flour Shop, and the Wherehouse on Liberty Street. Want to support local artists and business owners such as Colandrea? Promote your Newburgh business, event, or organization by designing your own logo or printing company swag with ColorCube. ColorCube Inc. is located at 1 S. Colden Street, Suite 100, Newburgh NY and is open Monday – Friday from 10:00am – 5:30pm.